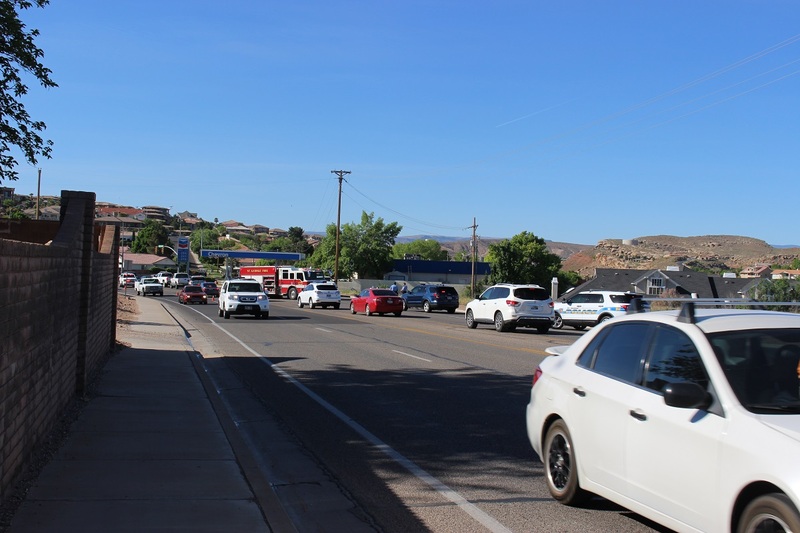 ST GEORGE — One woman was injured and transported to the hospital after a three-vehicle crash triggered when a driver drifted off of the roadway Friday morning. Shortly after 9 a.m. a call came into the St. George Communications Center reporting a three-vehicle collision at the intersection of South River Road and Ft. Pierce Drive North, St. George Police Officer Dave McDaniel said. 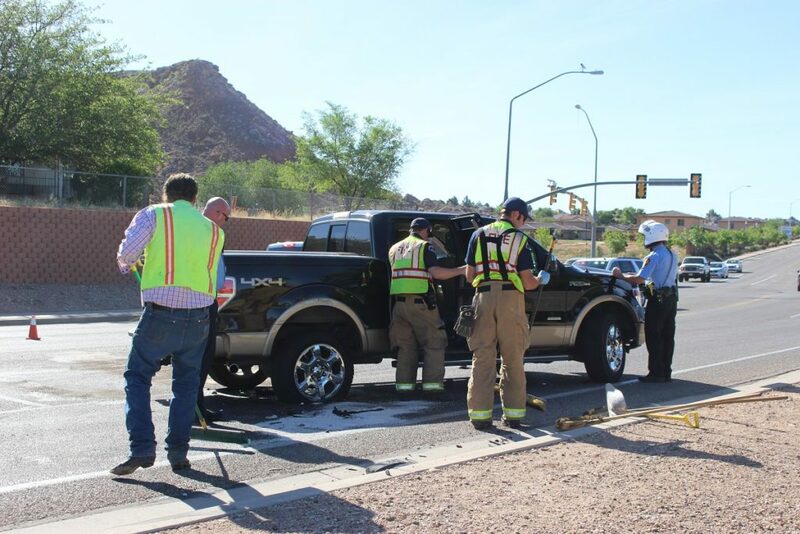 Once emergency personnel arrived they found a brown Ford pickup truck, a silver Honda passenger car and a silver Saturn SUV blocking both southbound lanes of traffic. Paramedics from Gold Cross Ambulance were already on scene when officers and firefighters arrived, McDaniel said, as they were in the area when the crash occurred and called dispatch to report the incident. 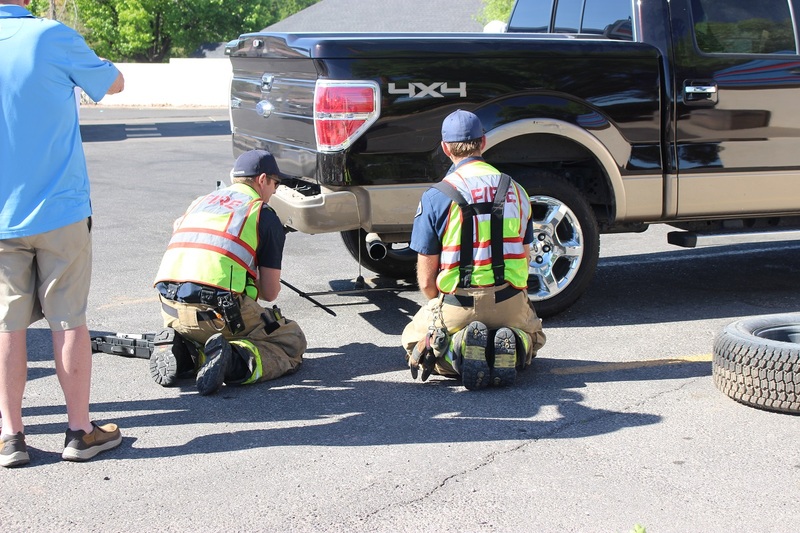 The driver of the Honda was injured in the crash, and she had been transported to Dixie Regional Medical Center for evaluation and treatment. “The Honda driver’s injuries are unknown at this time because she was already transported when we got here,” McDaniel said. Officers determined through the investigation that the woman driving the Saturn was heading south on South River Road and was “on her phone and looking down,” McDaniel said, as her vehicle drifted over to the right and hit the curb. Traveling at more than 35-40 mph, the Saturn bounced back over to the left and struck the Honda, launching it into the rear bumper of the Ford, McDaniel said. After impacting the Honda, the Saturn continued south and struck the Ford before it came to rest near the front of the truck, he said. “She hit the Honda … and then went around the Honda because she still had enough speed and ended up hitting the Ford again,” McDaniel said. The woman driving the Saturn was cited for using a handheld device communication violation and following too close, he said. “That citation is for the texting law, and with serious bodily injury, which is an arrestable offense,” McDaniel said. Both the Honda and the Saturn suffered extensive damage in the crash. The airbags were deployed and both cars were later towed from the scene. St. George Firefighters changed the rear tire on the Ford and secured the rear bumper, which allowed the driver, Bry Wallace, to drive his truck from the scene with his pets sitting safely beside him. “This has been a totally wonderful experience with these guys,” he added. Traffic was impacted for nearly an hour as both southbound lanes were closed, and traffic was diverted into the center lane. 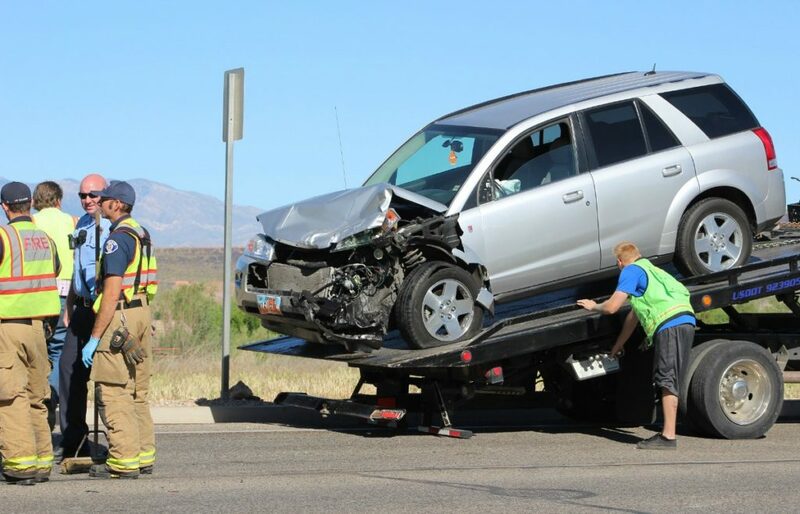 Posted in Local, NewsTagged 3-car crash, Accident, cedar city, collision, crash, Crash with injuries, Ft. Pierce Drive, gold cross ambulance, River Road, St. George Fire Departement, St. George Police Dept. Until they outlaw or seriously punish texting and use of handheld cells while driving, the other parties involved should be allowed to choke the living daylights out of the offender. It’s an arrestable offense but was she arrested? Will she be back on the road tomorrow in her hubby’s car and back at her texting and driving habit? My friend got a texting ticket back in 2012 and the police man said he is lucky because the laws were changing, meaning greater punishment. The $300 ticket he got would be enough for me not to want to make that offense. It’s probably up to a $1,000 fine now so I am sure that lady will learn her lesson from this. A few years back , a woman was traveling south on Dixie Downs while looking at her phone & rear ended another car . Altho the car damages were minimal , the car that was hit from behind ended up hitting a couple walking & killing the husband . I thought laws changed after that regarding phone use while driving . Anyone have an update ?